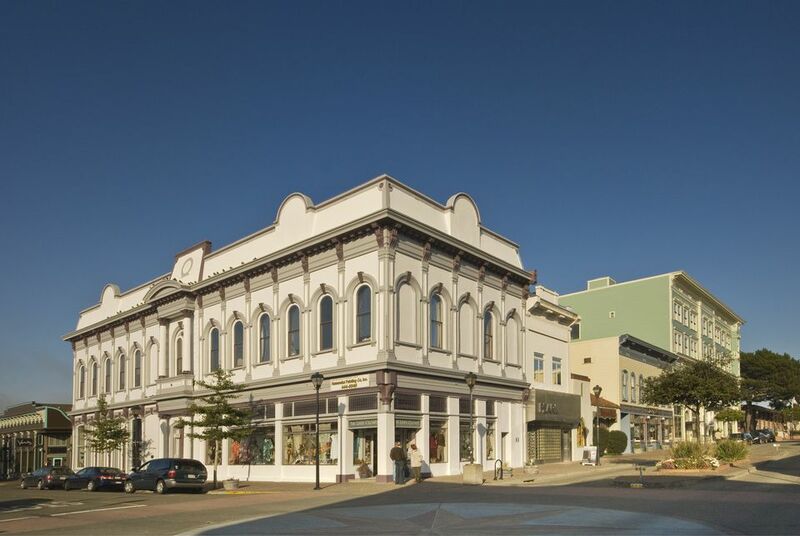 Eureka, California is the most central spot to base a tour of California's north coast or to visit Humboldt County. With a Victorian-styled Old Town, water sports on the bay and plenty of natural beauty all around to enjoy. Eureka and Humboldt County are popular with travelers who are hikers, nature lovers and anyone who likes Victorian architecture. You can plan your day trip or weekend getaway to Eureka and Humboldt County using the resources below. Weather around Eureka is most likely to be rainy from November through March, but temperatures are usually comfortable, ranging between 55 and 65°F for daily highs year round. Attendees for the annual graduation at Humboldt State University fill hotels and restaurants in Arcata, Eureka, and other nearby towns. It's a close call for visitors between the local redwood forests and the Victorian-style structures that were built from them, but we recommend the town of Ferndale if you only have time to do one thing. This cute little town, which stood in for Lawson in the 2001 Jim Carrey film The Majestic, is sometimes called Cream City because of the dairy farms that fill the verdant valley surrounding it. Some say it's California's best-preserved Victorian village, with a charming downtown full of lacy architectural detail and interesting shops. If you're more of nature lover or haven't seen towering coastal redwood trees before, see more about the forests below. Redwood Forests: There are so many redwood trees along the north Humboldt coast that you'll find a gaggle of state and national parks all with the word "redwoods" in their name. Among the best spots to stop is the Ladybird Johnson Grove in Redwood National Forest or Prairie Creek Redwoods State Park, a World Heritage Site where you can sometimes see Roosevelt Elk grazing. Take a scenic drive and see the redwoods by car on the redwood highway. Old Town Eureka: An interesting collection of shops fill the Victorian storefronts of Old Town along 2nd Street between C and G Streets. A few blocks away is the Carson Mansion (143 M Street), an exuberance of Victorian architecture that's not to be missed (but unfortunately not open to the public). Fans of old-fashioned machinery and Victorian architectural detail will also enjoy the Blue Ox Millworks (1 X Street) and their historic park. Eureka: Grab a beer and take a tour of award-winning Lost Coast Brewery. Learn their history, brewing process and sample a variety of beers. Reservations are required at least 24 hours in advance. The tour lasts up to 30 mins. Must be 21 to take the tour. If you have little ones with you, they offer Lost Coast Root Beer on tap, as well as root beer floats and Humboldt Creamery ice cream. Eureka: Eureka Heritage Home Tour is a self-guided tour that can be done by car or foot, of Eureka's historically important buildings Pick up a brochure with a map and short description of each building, available free of charge at Many Hands Gallery, located at Second and F Street. Humboldt Bay: In summer, you can cruise the bay on the 1910 ferry Makadet, the last survivor of seven that once operated here. For a more active way to enjoy the water, rent a kayak, sailboat or canoe from Humboats Kayak Adventures or at the Humboldt Bay Aquatic Center. Arcata Marsh: Bird-lovers, take note. The marsh is on the Pacific Flyway, and over 425 species of birds have been sighted here. It's also an inspired marriage of wastewater reuse and wetlands restoration. Stop at their Interpretive Center for information about free public tours. Scotia: It's worth a quick drive through tiny, tidy Scotia, just off US Highway 101 south of Eureka. The last remaining "company town" in America is home to about 250 Pacific Lumber Company families, some of whom have worked for them for generations. Weekdays, pick up a pass, and you can tour the lumber mill. One of the wackier area events that visitors enjoy is the Kinetic Sculpture Race. Every Memorial Day Weekend, artistic, human-powered vehicles make a three-day trek from Arcata to Ferndale, passing through towns, over sand dunes, and across the Humboldt Bay. If you can't go to the race, you can still see decades of kinetic race history and fun at the Kinetic Museum and Greasy Gears Gallery. In June, Arcata hosts the Arcata Bay Oyster Festival, which features the locally-grown bivalves and includes a tongue-in-cheek oyster-calling contest. August through May, Humboldt State Center Arts hosts artists and performers that have included Herbie Hancock, Lily Tomlin, the Peking Acrobats, Forever Tango and many others. California's oldest county fair kicks off in August for ten days of live horse racing, carnival rides, musical entertainment, livestock shows, and home arts demonstrations. Every Labor Day weekend, the town of Willow Creek hosts their annual Bigfoot Festival. Parts of US 101 are two-lane, winding and hilly. Allow extra driving time and try to reach your destination before dark. If anyone in your group suffers from motion sickness, apply your favorite remedies. Reserve ahead for holiday weekends and during the Humboldt State University graduation. The Samoa Cookhouse near Eureka is the West's last surviving lumber camp cookhouse, in operation since 1890. It serves three hearty, old-fashioned meals a day in a simple dining room that hasn't changed much since the lumber company employees ate here. While you're there, take a quick drive past the cookhouse and into the former Hammond Lumber Company town of Samoa to see where the workers lived. Seascape Restaurant next to the Trinidad Pier serves fresh fish and is famous for its blackberry pie. For lodging options, go straight to Tripadvisor's reviews and price comparisons on hotels in Eureka and their listings in Ferndale. Humboldt County is in northern California, stretching from the coast inland. To get there from north or south, take US 101. Eureka is 272 miles from San Francisco and 309 miles from Sacramento.